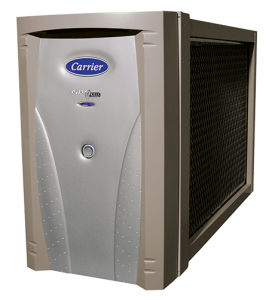 Air cleaners let air pass through a built-in filter to remove particles and are built directly into your HVAC system. They are installed between the air return duct and the furnace or air conditioner so that all air flowing in your home’s duct work is cleaned. Air cleaners also help prolong the life of your heating and cooling systems and prevent dust, dirt, and other debris from building up inside the units. A common question is, “Are air cleaners and air purifiers the same thing?” The simple answer is —no. 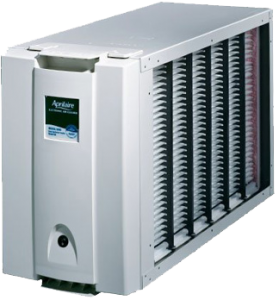 Similar to an air cleaner, air purifiers remove contaminants from the air. However, instead of using a built-in screen or filter, air purifiers zap impurities using UV (ultraviolet) germicidal lamps. What Do Air Cleaners / Air Purifiers Filter? 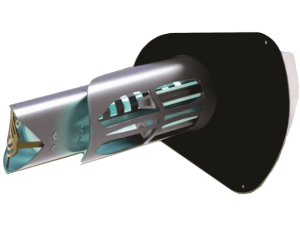 The Model 5000 uses a combination of electrostatic technology and traditional air ﬁlter to remove up to 98% of airborne particles* as small as 0.1 micron. • Removal of airborne virus-sized particles and ultra-fine particles — down to 0.01 micron in size. Cabinet supports up to 400lbs. Today’s energy-efficient homes seal in more airborne irritants than ever before. Dust, dirt, pollen and more are circulated throughout your home through the heating and cooling vents. These unwanted particles can settle on your furnishings, pollute the air that you breathe every day and can restrict airflow and alter the performance of your home comfort system. 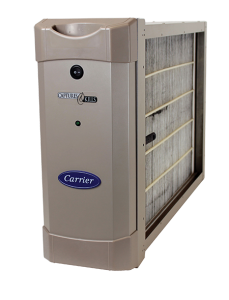 The Carrier EZ Flex filter, cartridge filter, and cabinets can help clear the air while delivering a number of benefits to your indoor furnishings, your home comfort system and more. The Refresh Air is the next generation of indoor air quality (IAQ) technology. With increased ionized hydro-peroxide output and the enhanced catalyst with zinc it is capable of purifying every cubic inch of air that the heating, ventilation and air conditioning (HVAC) system reaches. It is effective against all three categories of indoor air pollutants: Particulates, Microbials and Gases. Thoroughly tested to safely remove the risks of airborne and surface bacteria, mold spores and viruses, such as MRSA, e-coli, and Norwalk, to name a few. It also eliminates off odors from cooking, manufacturing and processing foods. • Reduces sneeze germs by 99% in the time a sneeze can reach three feet. • Provides whole home and building purification. • Easily integrated with the existing HVAC system. 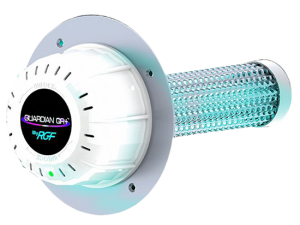 The Guardian Air QR+ is an in-duct air purifier capable of purifying every cubic inch of air that your central heating and air conditioning system reaches. Proven to eliminate bacteria, viruses, mold and VOCs, the Guardian QR+ is also very effective at reducing unwanted odors from cooking, cleaning chemicals, pet areas, smoke and musty air. Say goodbye to smelly, stuffy, musty rooms and hello to fresh, clean, pure air throughout your home or office building. • Unlike portable units that are limited to the room in which they are placed, the Guardian QR+ provides whole home and building purification. • Easily integrated with your existing HVAC system, the unit doesn’t take away living space and operates silently. • PHI can reduce sneeze germs by 99% by the time the sneeze has reached three feet. • Low maintenance: No costly filter changes, all you need is a PHI-Cell® replacement every 2 years and only takes 5 minutes. • The Guardian QR+ has a quick-release feature for easy, no tool cell replacement.